If you use the mobile Google Maps application on a phone that has GPS, you're sending Google real-time traffic information. "When you choose to enable Google Maps with My Location, your phone sends anonymous bits of data back to Google describing how fast you're moving. When we combine your speed with the speed of other phones on the road, across thousands of phones moving around a city at any given time, we can get a pretty good picture of live traffic conditions," explains Google. It's an interesting way to use GPS information on a grand scale to solve practical problems. Many other Google services collect data that help Google develop new features: GOOG-411 collects voice samples that train Google's speech recognition systems, Google queries anticipate flu activity, while query refinements improve Google's "did you mean" feature. 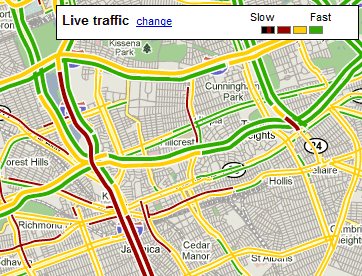 Apparently, this new source of data allowed Google to expand the traffic feature to arterial roads. "Commuters have long relied on traffic sites to help them determine their last-minute path around poor traffic on the highway. But if the traffic looks bad on the highways, you'll probably want to know how it looks on the alternate routes through arterials," explains Google LatLong. For now, Google Maps provides live traffic data for a small number of countries (US, UK, France, China), but crowdsourcing could expand its availability. Do you guys have any intention to give any of this data back in a data feed sort of way? I'm surely not the only programmer out there who could do something interesting with the anonymous location data we're providing you. "Anonymous location data" ? Mwahahaha :D ! How Google could make us sure about that ? Why be concerned about this? I don't see any reason to worry about Google collecting this kind of data. Not for now. But just wait & see how powerfull this could be to have all data about someone... If a compagnie has just 1 or 2 data about you, why not. But the merging between all your data could be very powerfull. For good (I believe Google will do good things) but also for bad : just imagine a hack of your Google account in 2 years when the services will be upgraded to awesome things (with your last locations, your calls and texts - gg voice -, your contacts, your private pictures/videos, your work on Docs, ...). I 'm affraid about that :( . so the argument of the coward is that Google itself is good, but their security is lax? I have no issues trusting google with my data as long as they continue to provide me with google api's to work with and as long as they continue to make news for requiring judicial subpoenas be appealed and reviewed by higher court before complying. I trust google more then my own apartment in terms of keeping my personals secure. Also when google becomes self-aware i believe it will be kind enough to enslave us vs liquidate a la Skynet. Mike2 > I 'm trusting Google security. But someone could always can stole your password and has access to all your life with just your Google account. If you walk the speed you will be going will be much slower than everyone else and it will be fairly obvious. Also, you probably wont keep the map open persistently, because that kills the battery and you don't need to check the map every few seconds when you're traveling at walking speed. What if one is a bicycle commuter? Maximum effective speeds will range from 15kph to 30kph. To Google, that will give the appearance of a log-jam or, at the very least, moderate traffic congestion. When, in actuality, things may be moving quite smoothly. This is a great idea, but I think there need to be many refinements to make it a useful tool. What could you talk about it? how we can add this map in our iphone mobile application?? This is the price when you are living within the 'without boundary world'. Nothing's free in this world. It's look like you are using Google for free but without you knowing it, you are feeding Google with some information that might a good used for some, & not for others. Everywhere there's a con who will still something from you. So, it's up to you how are you controlling your information within this wireless environment. Just my 1cent opinion ;-). to answer everyones question about bikes and pedestrians skewing the results. just think about how many cars frequent a given city street ing a day, now think of the number of pedestrians you see walking. the random data collection is based on an average of all the phones traveling between given points. so, if 10 cars pass at 45, and one pedestrian passes at 5, the average is something like 43 or something. this wouldnt raise any alarms anyhow but when the average speed is lowered to say 30 (yellow) or 20 (red) then theres obviously a traffic jam and not 1 car and 50 pedestrians.